A plague of Japanese beetles descended on Kentucky about 25 years ago. Just as the blossoms on the fruit trees opened, the beetles swarmed in and devoured the leaves and flowers. Although the spring air was fresh and cool and scented with rain, my family’s small orchard looked like late autumn. Brown piles of leaf skeletons lay littered on the ground. The beetles had eaten nearly every leaf, leaving only the veins and outline of the leaf itself. The stems withered and the leaves dropped to the ground, settling on the soft green grass in lifeless, crunchy layers. We sat in lawn chairs enjoying a family gathering. The topic of conversation was the plight of our fruit trees. We all knew there would be no harvest of apples or luscious, golden pears from the 75 year old tree we sat beneath. We groaned, moaned, and insulted the beetles. My mom, however, was quiet throughout. Finally, she got up from her chair and went inside. Within minutes she returned with a small cardboard box. Everyone became silent. She opened the box and took out a delicate golden leaf. She held it up to the light. They were beautiful; like leaves woven loosely of gilded thread. 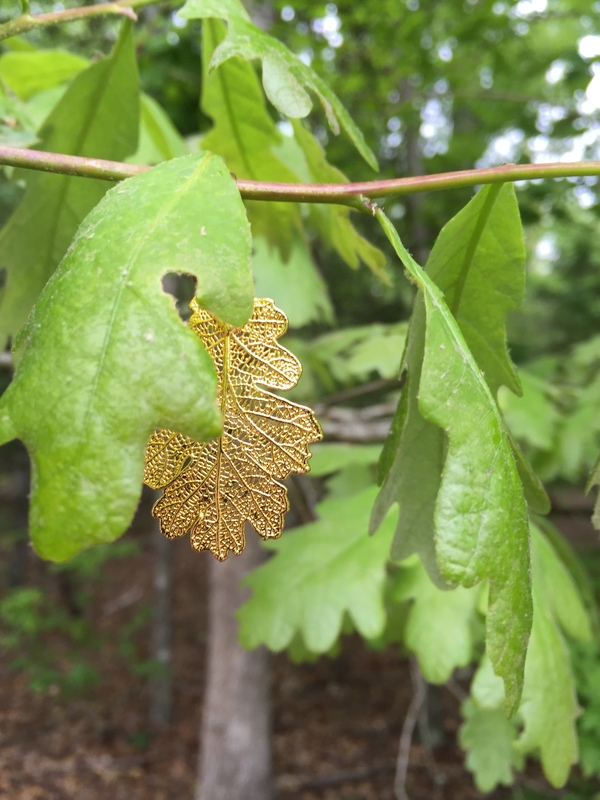 Ravished leaves lavished with gold became exquisite in my mom’s artistic hand. She had looked beyond what was and saw what could be. She chose to look with eyes of possibility, and her perspective changed the direction of our conversation. God looked beyond what was and saw what could be. He chose to look with eyes of possibility. Payment for an impossible sin debt became possible through His masterful hand, by the giving and taking of One Perfect Life. Souls ravished by a plague of sin, brought onto all generations of mankind by His first children, were made beautiful through Jesus. Through faith in Jesus, and belief in His death in the cross as payment for our sin, our spirits become eternal, and our lives begin a change of direction, beautifully crafted by the hand of the Master Artist. God did this because He cherishes us. He demonstrated a love that goes beyond human comprehension and displayed a vision that reaches farther than the scope of mortal imagining. When we accept God’s grace and admit our sin, He lavishes us with eternal life, the blessing of Jesus living in us and the golden promise that He will never forsake us and that His love will endure forever. God lavished His love on us by giving the golden life of His Son to cover over our lifeless and sin ravished souls. God saw what could be instead of what was! Believe in Him and know that He cherishes you with an everlasting love. Ask Jesus to come into your heart, forgive your sin and begin changing your life. You are cherished by the Almighty God. I got a pair of golden leaf earrings (one of them in the above photo) for my mom not long after that afternoon in the orchard. I wrote a note to her about how her positive perspective impacted me, although the spiritual analogy I see now didn’t come until later in my life. I believe God had intended that lesson all along! When she died, I found the earrings in her jewelry box, and the memory that clung to them sprang to life.